It has been a year since Sarkis Kotanjian, Executive Director of “Hayastan” All-Armenian Fund (HAAF) Western U.S. region, gave a TV interview, during which he made so many untrue statements about the Fund that I could no longer put up with the lies. I started working on a detailed report about the true face of the Fund, based on both my personal experience and ample evidence from eyewitness accounts and press. 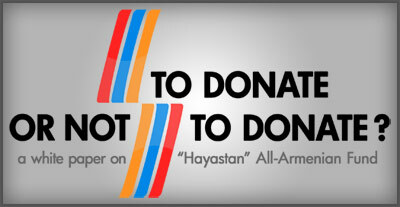 The white paper was titled “To Donate Or Not to Donate?” (Click here for the Armenian version), which covered a wide range of issues related to the HAAF and the Armenian government. I had a meeting with Sarkis Kotanjian shortly after the interview to understand why he was drawing such an inaccurate picture of the Fund on TV. It became obvious that he was misleading thousands of viewers knowingly. The ultimate goal of the white paper was to raise awareness among the Armenian donors about the reality behind the veil of deceptive propaganda and to present viable solutions for those ills, which plague the fund. The research was also intended to spread the word about the negative impact of charitable activities on the overall development of Armenia and Artsakh, based on various international studies. The first part of the white paper was published at The Truth Must Be Told, about a month after Kotanjian’s infamous interview, on December 17, 2010. The first professional Armenian news outlet to pick up the report was Hraparak Daily, based in Yerevan, after the release of Part II in January 5, 2011. Hraparak Daily reprinted both parts on the same day, January 6, 2011. And this republication marked the beginning of a long journey of the white paper on HAAF through Armenia, Artsakh, and the Diaspora. When an enthusiastic young man voluntarily translated the report into French and posted it piece by piece on the forum of Nouvelles d’Arménie, the thread immediately became the hottest topic in the forum. The forum users were discussing every aspect of the report. They eventually demanded that Bedros Terzian, President of the Fund in France, respond to all the arguments made in the white paper. Instead, Bedros Terzian ordered the editorship of the French-Armenian journal to delete the entire thread. Unfortunately for him, I had been able to save it and repost it at my media blog. Terzian then published an article, “Pour le Fonds Arménien, par Bédros Terzian,” denying all the facts and allegations in the white paper with emotional patriotic statements. Soon the growing noise around the HAAF became too loud for the executive leadership of the HAAF to continue keeping silent. It was the publication of Part III that broke the silence of Ara Vardanyan, Executive Director of the HAAF in Armenia. He left a comment under Part III, denying every single point made in the entire report. The Armenian and English versions of Part III, combined, generated a heated discussion in the form of about ninety comments. Thus, assuming a fake identity, Sarkis Kotanjian was praising and promoting the Fund by giving false testimony. By claiming to be a diligent donor, who has checked and is now completely satisfied with the way his money translates into projects, Sarkis Kotanjian misleads people into trusting and donating to an organization he works for. On March 2, 2011, Ara Vardanyan made the following statement in a comment to Part III of the white paper: “Both I and Sarkis Kotanjian are ready at any time to sit with you on one of the Armenian Televisions and talk about all these things live. Lets see what is true and what is not” (sic). I accepted the challenge and sent a press release, “Ara Vardanyan, ‘Hayastan’ All-Armenian Fund Executive Director, To Debate Fund Activities Live on TV” to all major Armenian news outlets announcing the upcoming live TV debate. A couple of weeks following the publication of this article, I emailed Ara Aghishian, President and Chairman of the Board of “Hayastan” All-Armenian Fund’s U.S. Western Region affiliate, asking for a meeting. I received a call from his secretary two months later, on October 11, 2011, acknowledging that my email had been received and that Aghishian was going to contact me. He has not until now. Nevertheless, before and after my attempt to meet with Ara Aghishian, I have been able to meet with a few members of the Board of Trustees of the Fund’s U.S. Western region affiliate. But it has turned out that they were not as actively involved in the life of the Fund as one would expect a board member should be. They were uninformed about the issues that I presented, quoting the white paper. It is now obvious that Ara Vardanyan had offered the bold challenge of the live TV debate with the expectation of scaring me. But this was a grave miscalculation. My decision to take up the gauntlet forced the Fund to back up and rehabilitate its initial strategy of silencing the criticism by ignoring it. This explains why the executive leaders of the Fund did not react to the release of the final part of the white paper on June 21, 2011, despite the presence therein of serious accusations, such as the evidence of the Fund having abused its tax-exempt status for the benefit of the oligarchs, who dominate the Armenian economy. Throughout the entire year, I have tried to raise awareness about the problems associated with the Fund’s activities and its role in Armenia’s development. I have also tried to generate public debate about the pros and cons of charity for Armenia today. I am deeply concerned with the consequences of humanitarian aid, which has been promoting dependency among the Armenian population on charitable handouts and laziness of the government to carry out its duties. Though the white paper built a sizable audience in the Armenian Diaspora and stirred debate in the U.S. and across the Atlantic, it is sad that the Fund preferred a policy of denialism over dialogue. Today on the threshold of the consecutive phonethons and telethons taking place in different communities of the Diaspora, it is important for the Armenian donor to think twice before making a decision to donate. Remember, not all that glitters is gold. It is important to differentiate between short-sighted benevolence and long-term sustainability. We should look a few steps ahead and understand the need to amend the agenda. The leadership of “Hayastan” All-Armenian Fund is infested with the authorities who have failed the Armenian people in so many ways that the only support they need is a helping hand to get rid of their yoke. Diaspora needs to form a new generation of organizations that demand government accountability, rather than fix and cover up a few of the countless consequences of government corruption.